If you don’t hail from the American “Barbecue Belt”, you’d be forgiven for thinking that barbecue sauce is barbecue sauce is barbecue sauce. But as anyone from the southeastern to southwestern United States can tell you, barbecue sauce is a matter of passionate debate and dramatic regional variation. With this in mind, I tread lightly into the BBQ arena. I make no claims to being a barbecue authority, I will not voice an opinion on whether the thin, vinegary sauces of eastern North Carolina trump the thick, sweet sauces of Kansas City, and I do not possess the secret to perfect pulled pork, beef brisket or sticky spare ribs (not yet, anyway). What I do have, however, is a family barbecue sauce recipe passed down from my granddad in Florida which can add authentic Barbecue Belt flair to your outdoor (or indoor!) cooking endeavors. After a fair bit of research, I’ve determined that my granddad’s sauce is closest to the Western North Carolina style: it is tomato-based, tangy and spicy, with more of an edge than the heavier, stickier sauces which are typically sold in stores these days. It is pleasantly but not overpoweringly smoky, and it has a kick that will set your tongue tingling without completely searing your taste buds. In keeping with southern barbecue tradition, this sauce begs to be slathered over pork ribs or used for chopped pork BBQ, but it’s a treat on chicken as well—oh, and it makes an addictively tasty hot dip for cocktail sausages if you happen to be throwing a soiree. So, a word about some of those ingredients. Most of them are pretty straightforward; I use Heinz ketchup, French’s mustard, Kikkoman soy sauce, and cider or white wine vinegar (though I think malt vinegar would be nice as well). I also use plain white sugar, though you could try brown sugar for a change of pace. 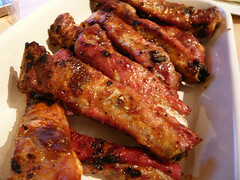 The smoky and spicy aspects of the sauce are a bit trickier. My family has always used Spice Islands Old Hickory Smoked Salt, which is very dark, very smoky and very finely ground. But even in the States, this salt is only available online now, and I’ve never seen anything like it in the UK. Luckily, there are other smoked salt options out there. 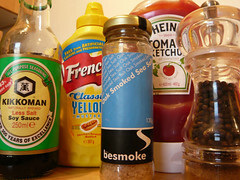 I’ve been using the Oak Smoked Sea Salt from Besmoke, which works fine, and Maldon does smoked sea salt flakes as well. Bear in mind, though, that some salts are saltier than others (really! ), and some smoked salts will be smokier than others, so you’ll probably have to do some trial-and-error testing to find the right proportions of salt and smoke for your taste. As for the hot sauce, only one kind flies in my family, and that’s my granddad’s datil pepper sauce. But since even I don’t have access to an endless supply of that, I’ve had to make do with store-bought sauces. Datil peppers are like a sweeter, marginally milder version of a habanero, so if you can’t find datil sauce, try a habanero sauce instead (I recommend the El Yucateco XXXtra Hot Sauce, which is widely available online). Look for a sauce that’s spicy but not too vinegary, something that will add both heat and flavor. Most of all, remember that there’s no right or wrong when it comes to barbecue sauce, despite what the barbecue zealots may tell you. 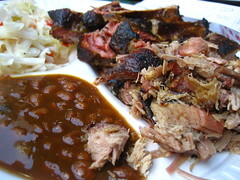 Hot and tart, sweet and mild, smoky and rich—barbecue sauce is whatever you want it to be, and that’s the beauty of it. Thanks for the recipe, I’m going to make this today. I’ll let u know how it turns out! No HTML please. URLs will be converted to links automatically. You can use **Markdown** syntax for *emphasis* and the like. Subscribe to the RSS feed for Principia Gastronomica.